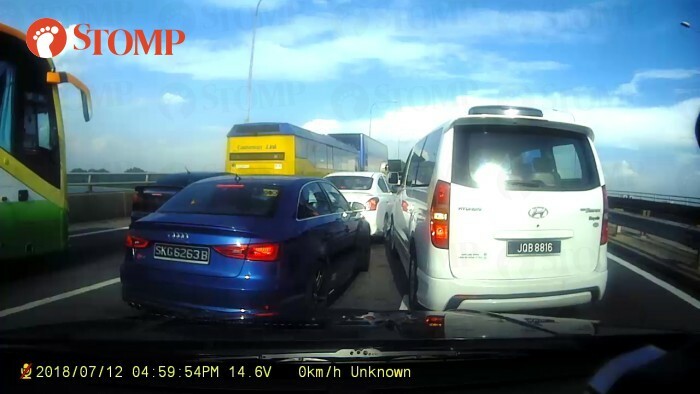 Two men on a Singapore-registered Audi got into an altercation with the driver of a Malaysia-registered Hyundai during a road dispute near Tuas Checkpoint on Thursday (July 12). The Hyundai driver was "physically attacked" by the two men, said Stomper Lizzy, who witnessed the incident at around 5pm when she was driving towards the checkpoint. Stomp understands that the incident occurred along the Malaysian customs. Lizzy told Stomp: "A bus had broken down on the first lane at Tuas Checkpoint. "As a gracious driver, the white Hyundai Starex driver signalled to indicate a lane change. "Most cars on the second lane practised the '1-in-1-out' rule to allow cars on the first lane to merge and overtake the bus, except for the blue Audi, SKG6263B." A video filmed by Lizzy shows how the Audi refused to let the Hyundai switch lanes. "The unfortunate incident did not stop just there," said Lizzy. "The Audi driver and his passenger stepped out of their car and started to physically attack the Hyundai driver. It was unfortunate that the Hyundai driver did not lock his doors. "I was utterly shocked at the behaviour of my fellow Singaporeans! I would have intervened but being a female, I was in an inferior position." In the video, the two men can be spotted coming at the Hyundai driver from both sides of the car and flinging his doors open. One man is also seen pointing aggressively at the driver and prodding him repeatedly. According to Lizzy, there were another two women with the men in the car and they looked like a family. The older of the two women had exited the Audi to intervene in the dispute. 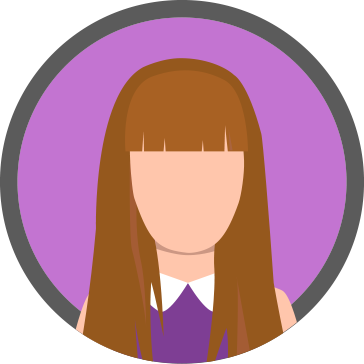 Lizzy added: "She was trying to stop the two men, while the young woman at the back of the Audi was anxiously looking from the rear window (I guess she was embarrassed)." The Stomper also said: "I managed to get in touch with the Hyundai driver, an old Indian uncle, at the Tuas customs. "My intention was to share the video in case he wanted to make a report. He confirmed that he was physically attacked and mentioned that his left ear was slightly painful. "However, as he has a angmoh passenger on board, he was in a rush and seemed reluctant to pursue the matter. He also wanted to avoid trouble as he frequently enters SG-JB. "No one called the police as the road traffic was bad. And since the Hyundai driver did not want to pursue it, I doubt there is anything much we can do. Poor old man." The Stomper said she felt "utterly disgusted" by the two men's behaviour, adding: "I hope, through this footage, they will reflect upon their behaviour and stop being road bullies!"